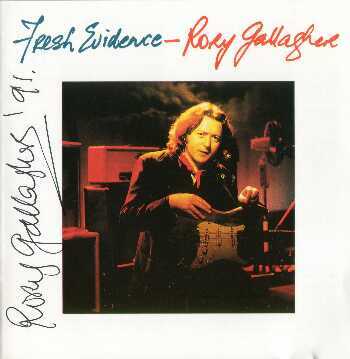 The article in the "Christian Science Monitor", July 29, 1991, was partly based on this taped interview, which Shiv Cariappa has kindly allowed us to reproduce on the Rory Gallagher Home Page. 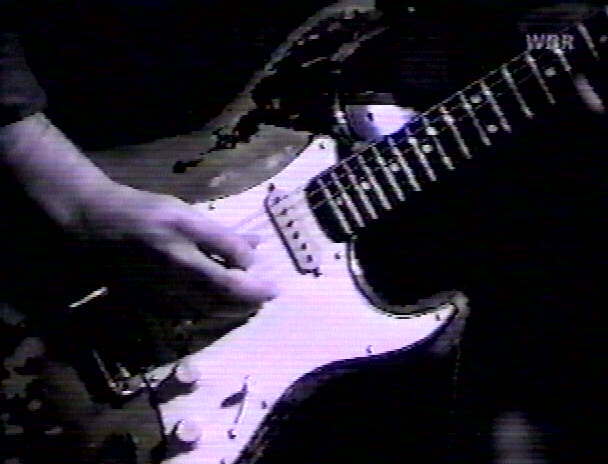 I first talked to Rory just before he got on stage at the Paradise Club near Boston on March 29,1991. He agreed to an interview from London because conditions were unsuitable to carry on a conversation at the club. Transcribed from tape on November 5, 1995 by Shiv Cariappa. Shiv Cariappa: I understand from Steve [Steve Karas formerly of I.R.S. Records] that you have a new line-up or that you are busy auditioning people. Rory Gallagher: Yes, I am trying out some new people. I am still on good terms with the other guys, but they have formed a band. The harmonica player used to be with a group called Nine Below Zero. They still want to make themselves available for me for odd gigs, but it is really not that practical. We have one possible show in New York coming up, but I don't think I will have a new band ready for that. So, I might do it with the old line-up. It is all a bit up in the air at the moment for the next day or so. SC. So Gerry McAvoy is still with you then? RG. Not really. I mean, he would do some dates with me if he were free, but at the rate I'm going to be working I think I will probably just get a new line-up. I am sorry to see him go, you know. SC. Yeah, but after 20 years, I guess it was time to move on. RG. Things move on, you know. They started doing these casual dates last year with Nine Below Zero, and they got to like it, and then they weren't particularly sure about my plans. Well, it happens to all musicians, they like a change of scene and so on. SC. Perhaps this will be a new direction - a fresh direction for you. RG. Yeah, well, I mean obviously new musicians give you new morale and so on, but it is going to be quite difficult. I have such a repertoire of songs that I have to work hard at rehearsals, but if I am lucky with the right musicians it will give me a new bite, but I am the first to admit that I am sorry to see them going, but you know, it was very amicable. I knew about it before we went on the last American tour. But like I said, if I am really stuck and they were free, they would fill in, but you can't really operate like that, you know. SC. I mean, so you have got several decades of music hopefully. SC. How have you managed to stay clear of that self-indulgence, you know, over the years? RG. Umm. In the sixties I found a few of my favourite groups surprised me - they started as blues bands. It was not that I was narrow-minded but I was surprised to see Paul Butterfield's [blues] band making a single, and then I saw Fleetwood Mac making one. At least Butterfield's songs were sort of blues songs. Fleetwood Mac who I admired and I liked Peter Green, they came out with Albatross. RG. It was a very nice tune. It was a start with them softening up [releasing singles] - you know what I mean. RG. And groups like Free made singles. I mean, it is ridiculous, even Bob Dylan makes good singles. But for some reason a certain attitude crept into me then and I decided [not to release singles], but now about bringinga possible single out for radio play, I might do that. But I would never squander my whole credibility, whatever that is, just for one silly song. I mean, at this point if I had a very good song that I believed in, I wouldn't mind. But I find that a lot of good rock musicians come out with very trivial songs [as hits], and I think that's what ruins it. Whereas if you come out with a really strong contender then I think it is OK.
SC. How have you managed to shield yourself from all the excesses, self indulgences, and just the number of things that go along with being a musician on the road? Is that a fair question? RG. Well, it is a fair question, but it's hard to answer. I've been generally lucky. A lot of musicians I knew, like Paul Kosoff, passed away - and [ones] I didn't know, like Hendrix and Brian Jones. All those deaths warned me off as a teenage musician. Well, I was nearly 20-21. I am not saying that I am a goody-goody, but when youcome from Ireland, you are brought up on a strict kind of line, you know. RG. You know, I never moralize or advocate you should live this life or that, but when you are touring a lot, and you know, you can take any road you like, but I mean you won't last if you burn yourself out with drugs or alcohol. Some musicians seem indestructible, but even they have to pay a price for it, you know. I suppose everyone has to live their own life. SC. I've done a tremendous amount of reading about you, and I absolutely love your music. SC. I first heard Deuce way back in '72 or '73 when I was growing up in India, and my brother brought it from the States. SC. I love that song, and the other one was Crest of a Wave. You remember those? RG. I do indeed, I've been playing them the last couple of days, because the two remaining LP's that have to come out on CD are Photofinish, and Deuce, and a couple of tracks have to be re- mixed, edited, and that kind of thing, because they want them to be slightly modified for the CD. So I am listening to what could be done to help. I wouldn't change some of the tracks, but it so happens that I'm Not Awake Yet, is one of my own favourites. It is an unusual theme, because it was the nearest thing to an Irish-Celtic guitar part with a 12-string and so on. The actual idea was, well not like astral traveling, but quite often where you can control that point where you wake up and where you are still in semi-control dream state. That was the idea. Crest of a Wave, it was - vaguely - a story, I can't remember now. Well, the idea is in the song title itself, that you don't walk on people when you are flying high. RG. Yes, I remember that, yeah. SC. And you said you played guitar when your were about nine, and started hearing these old blues, root-blues tunes over the radio when you were a teenager over the BBC ... In my case growing up in India, the only thingswe heard were songs on radio were by Jim Reaves, Ricky Nelson - the Shadows were popular - but what attracted you to those songs like the Robert Johnson kind of music? RG. To begin with, for some reason I liked the acoustic guitar and the guy called Lonnie Donnegan who was the first guy to really influence me, and it turned out that he was doing songs by Woody Guthrie and Leadbelly, which were folk and blues songs. I like the themes of the songs. Obviously, I was a fan of Buddy Holly at the same time and Eddie Cochran. But initially for the first couple of years I was more interested in American folk songs and the acoustic guitar and the image of the American traveling musician - the drifter, you know. I was keen on rock and roll but I thought it was not the same. Then bit by bit when I heard Muddy Waters on radio and Jimmy Reed and obviously hearing contemporaries like the Rolling Stones and John Mayall. I mean, I listened to everything at that time that had that kind of appeal. The ultimate guy - in the long run, the connection between folk, blues and rock and roll is Bob Dylan, because he seems to be able to straddle across from Big Joe Williams right through. Not to mention he took all the country blues elements, the Woody Guthrie influence and then added on his own surreal lyrics and attitudes and so on. SC. Just to quote you from before, you said there was something rhythmic and raw about the music - that is accurate, isn't it? RG. Yes, I always liked the raw acoustic [sound]. I don't like records that are overproduced. I mean, I like Muddy Waters' because they were so rough and echoey, but the right kind of echoes, you know what I mean. Even to this day I don't like some of the mixes that people do. They take the rough edges of some very good pieces of music. A lot of the new equipment is designed to do that in fact, whereas some of the older recording equipment and echo machines - their deficiencies helped make the sound of that time. So when I go to the studio, I always look around for the older bits of equipment and compressors and things like that, you know. Solid state is another sound. Like, most rock or blues guitar players would tell you that they don't like using solid state amps. They don't have the full warmth of a tube or a valve. SC. What are you recording plans? In an interview you said you'd probably do a boxed-set, a live set, an acoustic set. Is that all included in a boxed set? RG. They will be separate. Even in a boxed set, probably one side will be acoustic of tracks that have already been done. But my plans are little bit tilted now at the moment because of trying to get a new band together and what have you, and mixing these two albums. I think a boxed set and an acoustic album will come together in the next nine or ten months. You know, I have plenty of engagements that I can take up at the moment, but the most interesting one that I might do is work with the Irish group, The Chieftains. SC. Have you ever thought of doing a video concert or documentary? RG. Oddly enough, Welsh television and Irish television both separately want to do a documentary on me in the future. I'd rather wait maybe another year to see what develops because it is something I wouldn't mind doing, not for the ego's sake, but for the sake of covering 20 odd years of music. That could be something interesting to do. Other than that, I am interested in film music anyway. SC. Have you done any film music? RG. I haven't. There is one vague offer, and it is the story of a blues band. It wouldn't be like Crossroads, but something in that line. I am still waiting on the script. The problem with that kind of music is that [laugh] Ry Cooder has cornered all that market. SC. Have you written anything since Fresh Evidence? RG. Oh I have. During the American tour I taped quite a few things in the hotel rooms. Mostly music rather than lyrics. I'll have to settle down for the lyrics. On the road you always jot down little bits and pieces. Those songs will be coming together in the next couple of months. SC. When you write music, do you remember where you wrote Shadow Play, or Tattoo'd Lady? Or did you got into the studio with the intention of writing Shadow Play, or did you wake up one morning with the idea? RG. Some songs I can distinctly remember where I was, whether I was in Cork, in Ireland, or London, or America. Oddly enough, when you are in the studio and the tapes are running and everything, quite often they would actually inspire you to write a song or finish a song that is only in the notebook. I can distinctly remember writing Shadow Play with a 12-string guitar because I was in bed with the flu in Ireland, and the effect of the flu seemed to affect me with the lyrics. Because with a bad flu you get slightly dazed with sleep and all that. But other songs I can't recall to mind right now, but some songs of course are half written today and half written a week later, or quite often they lie in the notebook for six months and you just simply can't put it together with the music or vice-versa. But after writing quite a few songs now, I've got, not a method, but a way of being patient with a couple of verses or a certain set of chords. I can match them up quicker now than I used to. The one thing you do improve is songwriting. SC. I have another question. On Philby do you have electric sitar on that song? RG. Yes. Yes, that is electric sitar which I am crazy about. I love the sound of that. I rented that one from the Who. Pete Townshend has a hire company. Eventually I got one in New Jersey. It is very hard to get, but there is a company now in America doing replicas of them. Jerry Jones is the name of the company. Now that's another case. I was in Portugal once on a short holiday, and I wrote Philby there. I remember that distinctly. SC. I mean, that's a great song, I love that song. That is one song I kept playing over and over again. RG. Thank you. I was fascinated by his story. I read every book I could get on him, and of course he is not a great hero in England. I don't agree with spying and so on, but he was so audacious. I never heard a song before that - on a spy or a specific spy. I often wondered if he ever heard it. SC. Well, he passed away a couple of years ago, I think in Russia, didn't he? RG. Yeah, but that was quite a few years after the song came out. SC. There's two other songs, you know, Daughter of the Everglades, - now that is another favourite of mine. That is something I don't think you've done in concert, have you? RG. I think we only did maybe once or twice ever. It was quite hard to perform because its acoustic guitar is very prominent on the record even though there is an electric guitar. I could do it with Lou Martin on keyboards. SC. Do you still play with him? RG. I don't, but oddly enough he played on one track on Fresh Evidence and one track on Defender. But that song we played around Louisiana. It was a very obvious place to play that because of the setting there and so on. I had this sort of ballad, this story of someone drifting from the city away from somebody. It is kind of a sad little story, but I quite like it myself. SC. There is another song I kind of like - Failsafe Day. SC. You haven't played that live, have you? RG. I played that live in Europe. But unfortunately not too many times [in America], possibly once on the American tour, but we played it here quite a bit. I can't remember where I wrote that. The idea is like a holocaust type of situation, you know. I tried to make it not obvious as an Armageddon or anything like that. It is like, well I can't think East Berlin anymore [because] it wouldn't be the case. It is not unlike the idea of Heroes that David Bowie wrote. It is an isolated - an unusual city - where someone is getting very affected by it and the other person saying, you know, “"keep your control, keep your grip. The people running the world are not playing by the rules", something like that, you know. SC. Especially on Defender and a lot of your songs, it seems like you read a lot of mystery novels, like on Last of the Independents. Do you read a lot of mystery books? RG. I do, yeah. Well, I am a great fan of Raymond Chandler and Dashiell Hammett. SC. Continental OP - it's like a tribute to him? RG. It is, yes, indeed. It is his character, the Continental OP, a very vain detective, and I just wrote that one night after reading various stories of his, you know. He's got a book of short stories called the Big Knockover, and the “"OP" is in that. I've also got quite a few books on the life of Dashiell Hammett, which is quite an interesting story on what he's been through and so on. And I wrote songs like Big Guns which is about a guy who has bitten off more than he can chew. It is about a small-time crook. He's got to the point where he has no friends in the underworld and the police want him as well. And I used a similar type of guy, but more innocent, in the song called Loanshark Blues. SC. Yup! You did that in Boston. RG. Oh, did we do that? SC. Yeah! It was great. RG. Thank you. That one I was slightly influenced by The Picture on the Waterfront. The atmosphere more than the story. But I do read a lot of crime fiction, and I like Patricia Highsmith - she is a favourite of mine as well. She writes more psychological sort of stories. She has a lot of crime stories where she has maybe only one murder and only one cop in it, and it is not all cops and robbers. SC. You know in the 1980's, at least especially in the latter part of the 80's, for your fans, it seems like a lost decade. Seems like you almost disappeared from the scene. There was no mention of you. And you said that you had a flying problem. I gather that is behind you. RG. Yes, to a great extent. That is only one reason why we didn't go to the States. We just started concentrating in Europe, and I got delayed making certain albums, and plus some of the tours we were offered in America just didn't appeal to us, because it meant going around stadiums playing in front of some other huge rock band or a group that would not have an audience sympathetic to blues or rock and roll. SC. I understand. I remember you were on with Blue Oyster Cult, and I think Rush. A rather odd combination, I thought. RG. Yeah, we did a couple of those and they were soul destroying. I mean, we did OK on them. I am prepared to rough it, and I have roughed it before, but I prefer to play in a club or a small theatre if it comes to that. The trouble with the flying thing - I had a couple of bad flights, and this is after hundreds and hundreds of flights. If it happens to you on a bad day it can affect your psyche, you know. I've pretty much cracked that now, because on this last tour, I had to fly to Tokyo and then to Sydney, Australia and then to America and so on and so forth. People think it is wimpish, but when you pick up the paper and find out that Stevie Ray Vaughan got killed, it reminds you that entertainers are not any more important than anybody else, but you do get a little bit cautious, you know. SC. I understand. Another question: on your album Stage Struck, 1980, I gather. It seemed rather unrepresentative of your music, meaning it was all a rock production. Unlike Irish Tour '74, which you know displayed your entire musical vocabulary. And you are best known for your live performances, and it has been a long, long time since '74 I gather, to have something live out. Does that ring any bells in a sense? RG. Yeah, the sound on Irish Tour was a better sound, I admit that. We had a lot of difficulty mixing [Stage Struck]. In Europe, besides the eight tracks on the album, there were two extra tracks put in the package on a single, including one acoustic blues balancing out a little bit. Because so many tracks were recorded in different locations, the engineer tried to match up the sound. It is my fault of course, I was there, but it was a little too harsh, and it only gave the hard-rock aspect of what I do, so it is not my favourite album. RG. Indeed, and the irony of it is that we recorded so many shows around the world to get that. What we should have done is just gone into a club and stayed for three nights or two nights and just nailed it down. But we thought it was a novel idea at that time. You know, one night in San Francisco, one in Cleveland, one in Australia somewhere, you know what I mean, but quite of ten the more grandiose the project, the less effective it is, you know. SC. How do you feel about your writing and your musicianship right now? I mean do things come easier now? Are you right on top of your guitar playing? RG. I think I was in pretty good form on the tour. I am practicing every day. I don't really practice like jazz musicians, but I keep my chops together. I do need a couple of gigs really to get myself back in proper form. There is no way you can do that just playing at home even through an amp and all the rest of it. You need to be out on the road. Once I start rehearsing that will be a step in the right direction. But I have certainly not gone too lazy, I can guarantee you. Writing-wise, I have lots of things on tape and so on that I've got to work on, but I do have to spend a couple of sleepless nights on that yet. I am hoping to go back to Ireland for a few days, and that usually is a good location for working in. There's fewer distractions there. London is a pleasant enough city, it is not all that inspiring sometimes, because like any big city there's a lot of stress. You know what I mean. SC. You still have family in Ireland. RG. Yes I do. Yeah, in the south of Ireland. SC. I guess that's about it. Can we expect you here in the States? RG. A tour, hopefully yes if I can get all these things put together, you know. SC. How close are you to finding people? RG. I've got it narrowed it down to about six. SC. We are talking about all new personnel, right? RG. It looks like that. Initially, I am more concerned about drums and bass, 'cause that's what I need for the first week or two, and then if I want to add anything, I will from there. But if I'm gonna get a keyboard or something I would prefer to work with drums or bass alone for a week or two. SC. Anyway, I am just trying to write a story, and the basic theme of my story is not just the return of another great guitarist, but at least, you know, a lot deeper. Actually the lead of my story pretty much says that: just to borrow the title of your '75 release, you've been going Against the Grain. Something to that effect. RG. You know the strange thing, Against the Grain, is the name of Boris Yeltsin's new book, that is only by the way, you know. SC. Oh yeah, he's here in the States right now. RG. [Laughs] So I have to watch it, you know, but that is only by the way. SC. He just came to the States last night, and he was on television last night. RG. I hear he is already criticizing Gorbachev. SC. [Laughs] He already is. I don't know, but in my view he's come down a few notches. He seems rather like a populist, you know. SC. Some people call him another Mussolini, which is a little scary. RG. Gorbachev turned out a bit disappointing, but initially, and I think in the long term he will be a better bet than people give him credit for. SC. I think so, and he'll probably go down as one of the truly great men of this century. RG. Yes, he struck me as a man with dignity, you know, whereas Yeltsin I imagine can be volatile if things didn't go his way. His appearance looks tough, perhaps that comes in the way of judging him, but we'll see what happens, you know. SC. Oh, there's another line, which I thought of putting in - that you could quite easily teach a credible college course on blues masters, blues influences and trends. SC. I mean, I am basing this on an interview you did for Guitar Player back during Photofinish, and said you really have an uncanny understanding and knowledge of it all. RG. I hope Steve sends it on to me, I look forward to reading it when you got it put together. SC. We'll see - again like I told Steve, no promises, one never knows what the editors do with it. SC. It is really a pleasure talking to you. SC. And I really followed your music for a long, long time. It's brought me a lot of happiness, so I really thank you. RG. Thank you very much. SC. And good luck and all success to you. RG. Thanks very much indeed. RG. Nice talking to you. bye, bye. See you.